The rumors are true - Xiaomi is skipping a number and is calling its next flagship Mi 8. The information was confirmed by the company on Weibo, and it also made it clear that the phone will debut on May 31. 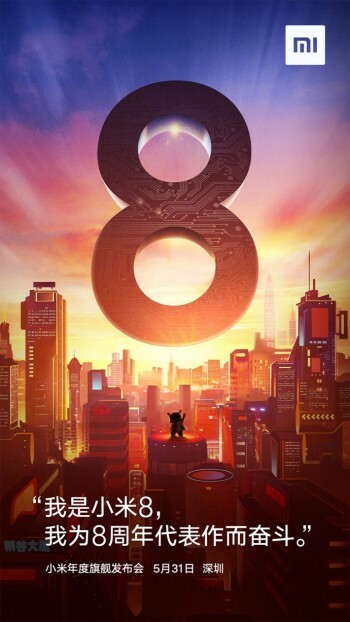 The leap from Mi 6 to Mi 8 is to celebrate the 8th anniversary of the company and is also matching the last digit of the current year for easier navigation. An earlier leak said the Mi 8 will have 6.01” screen with a wide notch that will have in-house 3D sensors for face unlocking. The chipset is known to be Snapdragon 845 since December, and pricing is going to be the hard to believer €420 for a high-end 8/128 GB version. Along with the announcement on Weibo, Xiaomi launched a quick giveaway on the Chinese social media. Everyone that forwards the blog post with a short memo will get a chance to win a Xiaomi Mi 8. Thanks for sending this in, Jason Wong! We have waited too long. Can't wait to see what you show the world this time!